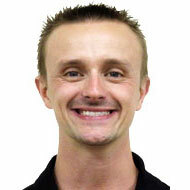 ← Educational Technology Evangelist and more ILT2014 Conference news! In last week’s post I talked about how easy it is to create Google Forms to evaluate progress and listed a few reasons why you may want to create one. In this post I will be taking things a step further by showing you how to make those forms more accessible… For free! 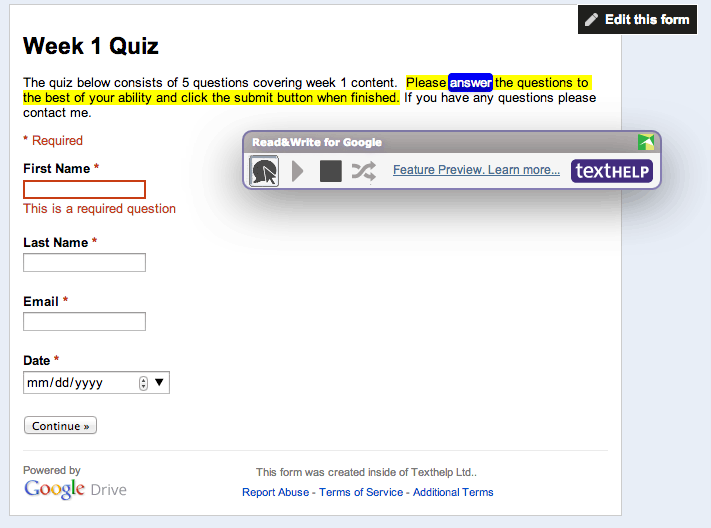 Specifically I want to explain how to make Google Forms more accessible for struggling readers by adding text-to-speech. Text-to-Speech software allows your computer to do the reading so that struggling readers can focus on comprehending the content. While there are many different text-to-speech applications available, our focus will be on the free version of Read&Write for Google, which contains high quality voices and dual colour highlighting (meaning it highlights words as they are being read), both of which are critical for struggling readers. Read&Write for Google is a Chrome extension that can be downloaded for free in the Google Chrome Web Store. Once downloaded you have access to many valuable features, including supports for Google Docs, PDFs, ePub files, web pages, and more. After 30 days, many features become premium. However, text-to-speech and single word translation tools remain free. Once Read&Write for Google has been installed you will notice a small green Read&Write for Google icon in your address bar (see image below). To access Read&Write for Google while in a Google Form, simply click the icon and the floating toolbar shown above will appear. There are two settings for text-to-speech on the toolbar. By default, the extension is set to “hover speech,” which means you just need to hover over text for it to begin reading. Hover speech can also be turned off. If you choose to do this, simply highlight text you wish to have read aloud and click the play button. Speech can be stopped any time by clicking the stop button. The image below shows a screenshot of text being read aloud with dual colour highlighting while in hover speech mode. 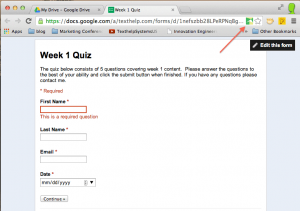 While Read&Write for Google works great in Google Forms, it will also read most other websites you visit. 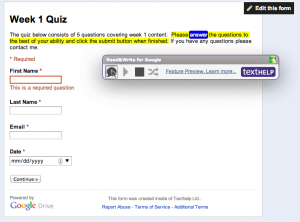 This is great if you want to link to articles from your Google Form for students to read and respond to. 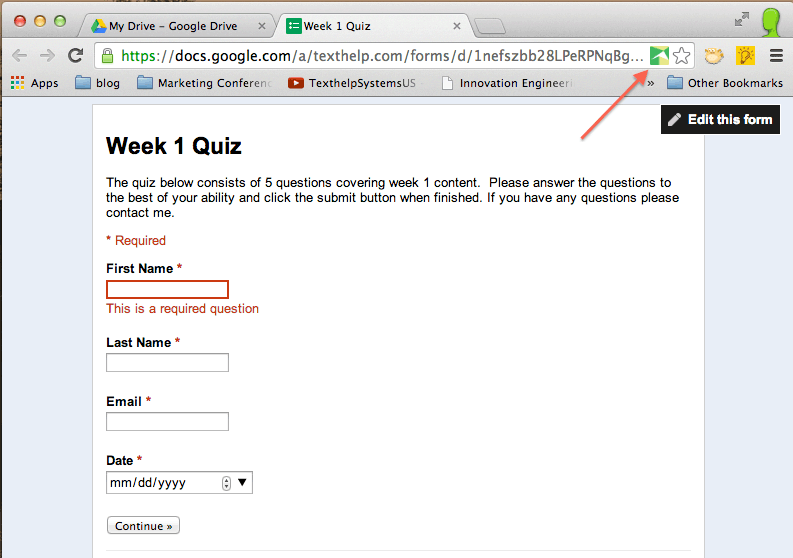 Simply include the link in the form and ask students to click the Read&Write for Google icon once on the new web page. The floating toolbar will appear and can be used the same as described above.